i was a very keen observer of politics for many years. but not since i moved into the rural/farming life. in fact, i believe that we are always on the losing side. even when the AAP phenomenon was developing, i remained disconnected, though marginally interested. while many may have moved on from the heydays of hope that anna hazare/kejriwal inspired, i believe that AAP phenomenon is still very worthwhile. i am an unabashed fan of kamal hassan's movies. have been for a very long time. since his turn into the political sphere, my non-existent interest in politics is showing signs of resurrection. i strongly believe that kamal will be a positive force for our society. there is skepticism and much rolling of eyes, especially from the upper classes. i really like that he is taking his time to roll out his plans. change needs time. we may be a society in a hurry, but speed rarely helps towards lasting change. he is a fresh breath and i foresee his contribution to be very valuable. and i aim to be a part of this process. nearly 7 years ago, appudu (appu) entered our lives. our first experience with pets. he entered as a rat-control remedy but he remedied us big time. he was all things one has seen and read about pet cats - only a bit better on most fronts! he taught us much and we are far better human beings because of him. he protected his turf fiercely from others of his kind of others of the slithery venomous kind. once, we had erroneously overdosed him while deworming. we took him to the chennai veterinary hospital and he overcame much odds to survive and in the process became a case study in the students' academic course work. we attempted to move him from pR with us to our new location, but he moved back to his comfort zone and continued his reign over our hearts - from a little afar. he died a couple of days ago. he will stay alive in other dimensions. since september 2016 till date - over 240 days, our area has received exactly ONE day of recordable-level rain and another 2 days of sprinkly drizzles. during this time, cyclone vardah demolished madras in early dec 2016, jaya amma died, jallikattu protests rocked TN (mostly forgotten now, i think) and more memorable events have transpired. the failed north-east monsoon of 2016 is already in the record books as the second worst ever in 150 years. and through may 2017, several parts of tamilnadu have received good summer rains, but a strip of width approx 30-40 kms along the coast from madras to pondicherry has missed out. through may 2017, we have had at least 15-18 days of very hot (>40 deg C) days. a scorcher of a month, never before experience by us (in 8 years). even our well shaded house with high levels of ventilation is barely tolerable. we had a sub-par agricultural performance in our main season from aug 2016-april 2017. yields remained low for paddy, dals, sesame and abysmal for groundnuts. through all this tough times, our well has stood strong and we have a good level of water. we are eternally grateful for the previous owners to have picked a great spot and dug such a bounteous well. as the south-west monsoon has set today (30th may 2017) over coastal kerala, we pray that we get some respite over the coming month(s). otherwise, some serious tragedies loom in the neighbourhood. we have also taken on 4 additional family members, 2 oldish cows (kamala and her daughter haasini) and one female calf (abirami). kamala was scheduled for the meat market, but the kind owner was happy to let us take her away and tend to her till her time comes. haasini still has some mileage left and will go back to the owners in some time. abirami may stay for a bit till she goes through her first delivery. and lastly sg kittapa aka kittu, a mongrel pup walked in seeking shelter and is currently 3 months old and a tyrant in the making. one thing that all of us are looking out for - a respite from this relentless heat. sometime in oct 2012, we found ourselves with time to kill in delhi. as chance would have it, we decided to visit the birla house memorial of gandhi and to our delight, shri narayan desai was delivering the moving gandhi katha series. we took our seats and were transported to the times of the freedom struggle. as the lecture was coming to close, i noticed a familiar dignified gent in our front row. he was shri anupam mishra, whose spell-binding ted talk i had written about. we introduced ourselves and he was all grace. he took down our address and very soon we received a copy of his book - aaj bhi khare hain talab - a veritable masterpiece on the water management practices of our ancestors. it was indeed an unforgettable evening to be blessed by two legends. shri mishra recently moved address and here is ram guha's evocative obit piece. tennyson wrote 'the brook' with the memorable line - for men may come and men may go, but i go on forever. it has been the lifetimes work of shri desai and shri mishra which has made this line a reality. we have been racking our brains for an appropriate response/comment to the many interesting events post november 2016. berry nails it. as we enter the eighth year of this rural/agricultural based life, over the zillion interactions we have had, we can only smilingly nod at berry's wisdom and realise once again, that such a deep understanding will happen only to those who feel the earth between their fingers each day. the demonetisation did not affect us directly much, but its impact in our neighbouring areas has been severe. why would the govt do something this hurtful has been easily explained in this article. remember our post on birds of pR back in 2011? well, the willing bird lover arrived in the form of our friend Sridhar with a brand new dslr! we set out at day break and dusk on couple of days and came home with these. 5) orphean warbler or plain prinia? not sure please help! Thanks again to sridhar for taking these fantastic pictures and to siddharth for quick spotting. Here are a few more species spotted by us regularly but not captured in camera. we will update this post as and when sridhar visits us again and shoots a few more pictures. A couple in (?) are the ones that only one of us have spotted. They will be confirmed with more sightings. 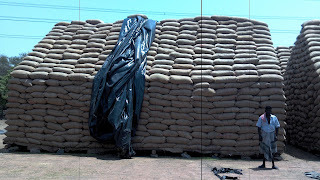 in the previous 2 posts - ruin after rain - part 1 and part 2 i had indicated a surge in paddy production. here is some evidence to back this. 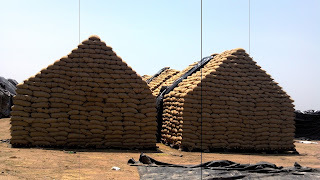 the state govt (parallel to the center (via the food corp of india)) procures paddy for the public distribution via ration shops (PDS), aanganwadis (ICDS), mid-day meal scheme in government schools and the amma canteens. the surge in production has meant a surge in procurement and thus what you see below. 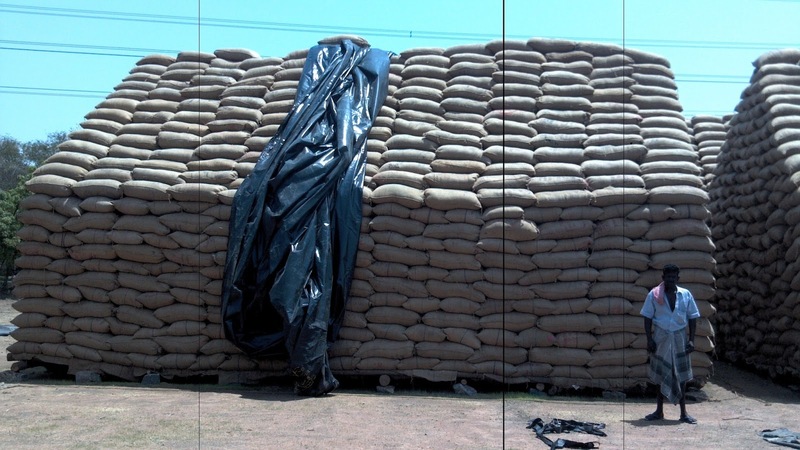 in this location, the supervisor indicated a total inventory of around 8000 tons of paddy. 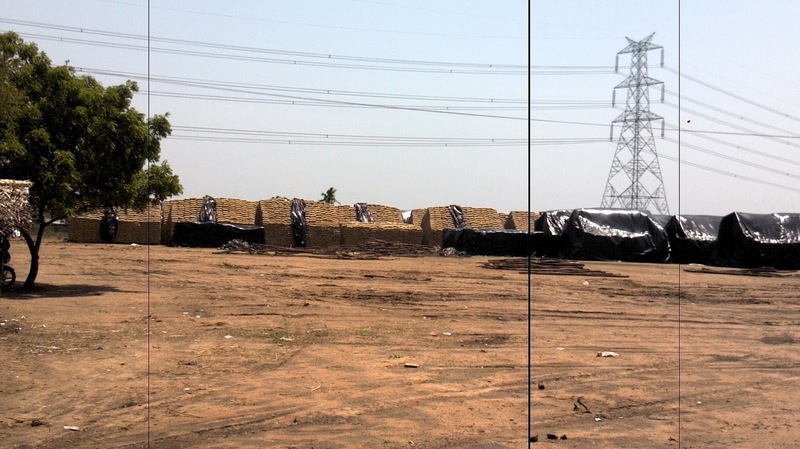 from the time of taking these photos additional rows had been added. there is certainly one more such location in the vicinity and may be more in the overall district. this is apparently a common sight in thanjavur - the main rice growing area of tamilnadu. and the entire crew is from there. to answer a common query - this production surge is not likely to see any impact in the price of rice in retail. these economics are beyond us for now!